Arise, thread, and walk again. Wayne Shelby Simmons, 62, of Annapolis, Maryland, a former occasional on-air commentator who appeared on a cable news network, was arrested today after being indicted by a federal grand jury on charges of major fraud against the United States, wire fraud, and making false statements to the government. Turns out he and the group he's part of--the Citizens Committee on Benghazi--were the ones who pushed lie that the White House ordered other US military assets in the region to "stand down" during the attack. See, what makes this so ha-ha funny is that Gowdy didn't so much work "behind closed doors" to stay above "the fray," as much as he repeatedly leaked the committee's goings-on to Politico. And what makes this so boo-hoo sad is that his Republican colleagues keep selling him out as leading what amounts to a partisan witch hunt. More proof that Ramirez is just a weirdly idiotic human being. I didn't realize that like 6000 people died at Benghazi. No wonder Republicans are so pissed off about... wait, what's that? 4 people died? Oh. There were at most 150 militants who attacked the US compound. How did that result in 6,000 people dying? Older article but worth reading. Which brings me to Beirut. If you read only one Benghazi piece this week (aside from mine of course! ), read this one by Jane Mayer of The New Yorker, which she called “Ronald Reagan’s Benghazi.” It was October 1983, and Mayer was a young Wall Street Journal reporter based in Beirut. Early on the morning of October 23, a blast went off in the U.S. Marine barracks compound. By the time Mayer arrived on the scene, “the Marine barracks were flattened. From beneath the dusty, smoking slabs of collapsed concrete, piteous American voices could be heard, begging for help.” The U.S. death toll was 241 that day. A few contextual facts for you. The gate at the barracks through which the terrorist drove his truck was open. He drove through some barbed wire, but that was it. The guards were unarmed. Additionally, this happened a mere six months after militants had bombed the embassy in Beirut, killing 63 people, 17 of them Americans. People is St. Reagan did it then it was because he was tricking them russkies into something. There's 2 beams for the almost 3,000 people that died in the 9/11 attack. I'm thinking Demo's joke requires you to assume they'd be using the same beam/victim ratio. Here I just figured it was the standard American exceptionalism calculation of the value of life: only American lives matter. I assumed it was for two towers not a statistical representation of the number of dead. 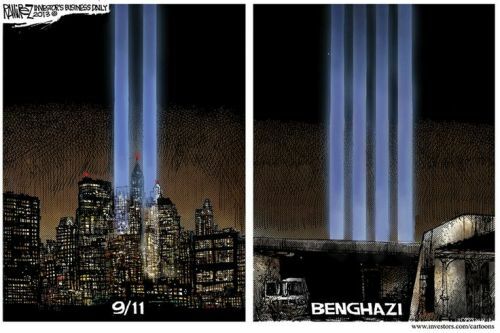 So there had to have been four towers at the Benghazi compound! It is in reality, but that's not where Ramirez operates from. Who knows what's going on in his head? I've already been forced to think like a 4channer this morning, don't make me think like a far right nutball comic artist. If I wasn't already familiar with Ramirez's previous work, I could see that being a commentary on how disproportionate the GOP response to Benghazi has been. Edit: And, now that the thread has refreshed, I see that shoptroll has brought up that point already. Ramirez is pretty far on the conservative side... so it's unlikely that he's calling the GOP out for anything. It's likely a bigger deal to him than 9/11 for the same reason that GOP politicians keep saying all this sh*t is for... it lets him take potshots at Hillary and Obama all day long. I just woke up and realized how much time the Republican Party has spent on Benghazi trying to "uncover" the "facts" vs the investigation and review of 9/11. In fact many of those responsible for the generally accepted "incompetence" theory were not subject to Hillary Clinton style scrutiny but rather promoted. Yeah, they're pretty lefty, but numbers are numbers. I'm watching Clinton's opening statement right now. She is killing it. Those fools have given her a wonderful, unopposed platform to demonstrate why she should be president. I will have to find that and watch it when I have the time within the next few days. I watched about an hour of the committee questioning Clinton during my lunch break. It's extremely easy to see this is all partisan, as are most things in Washington. The Republicans on the committee were regularly shouting, pointing at Clinton and talking over her answers constantly. One of the Democrats on the panel was nice and calm and kept pointing out that this is the 8th investigation we've had an no one has found anything but the Republicans keep implying they just want the truth. Anywho, this tends to support my feeling that some on the committee are ramping up the tirades. After nearly three hours of questioning, Jordan was the first Republican in this hearing to spell out the alternate history of the Benghazi episode that many on the right believe is the correct one. He spoke rapidly, interrupting Clinton at times, and personally accusing her of falsehoods. “Where did the false narrative start? It started with you, Madam Secretary,” Jordan said. After his questioning period ended, the committee’s Republican chairman, Rep. Trey Gowdy (S.C.), gave Clinton a chance to respond. The other interesting dynamic of the committee’s hearing was the contrast between the tone of Republican members like Pompeo and Jordan – who said that the meaning of Benghazi episode was already known, and it was that Clinton had failed in her job – and the tone of Gowdy, who has staked his credibility on the notion that the commission is a finder of fact, not a partisan tool to undermine Clinton. So while Pompeo and Jordan pressed Clinton to accept their conclusions about the episode, Gowdy insisted it was too early to know what those conclusions should be. Pompeo pressed Clinton about why no one at the State Department had been fired in the aftermath of attacks. Washington Post asks Why is Clinton Speaking So Slowly? The top answer: Because there are Republicans in the room. Watching Gowdy try to weasel a statement like "this is not a prosecution" and salvage the shattered veneer of legitimacy makes it very clear that it is the Committee on trial here and not Clinton. My favorite part was the Congresscritter who kept trying to pin this I-don't-know-what-culture-something-something on Clinton. "We have emails between two staff!" I was really on the fence about voting for Clinton (I still have reservations) but man she gained lots of respect from me today. I had honestly just tuned in to watch the Republican bluster. Still not a fan of her support for the Iraq War charliefoxtrot, but have to admit that her culpability in it is not anywhere near as great as the GOP's. I can't be the only one cynical enough to think the people who want an establishment candidate to win, the people who donate to both political parties, the 0.1% are very happy to give Hillary just such a platform. Better Hillary than Bernie right? I've had the hearings running in the background quite a bit today and am frankly pretty surprised at how poorly the Republican reps are coming off. One of them just read a fantasy letter he imagined someone would write. Seriously?